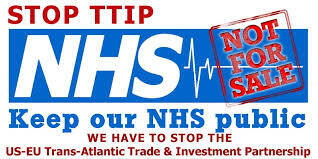 Stop TTIP write to your council….. The Transatlantic Trade and Investment Partnership (TTIP) currently being negotiated between the US and the European Union poses a severe threat to all public services. The most publicised danger is that faced by the National Health Service, which is why Keep Our NHS Public (KONP) has joined the movement to stop TTIP. However there is an equal threat to local governments’ ability to carry out policy and exercise the functions for which they are democratically elected. 1. TTIP’s purpose would be to remove and prevent regulation that would interfere with transnational corporations’ pursuit of profit. 2. This includes the reduction or removal of ‘non-trade barriers’ such as the rules governing health and safety, employment rights, control of toxic substances, food safety provisions, environment protection etc. 3. Requirements that the huge sums involved in local authority procurement be opened to tender would attract transnational corporations; and because local authorities would be prohibited from demanding ‘performance requirements’ such as local content, minimum wage, or gender balance from transnationals, cost would become the only deciding factor. Issues of quality could not be considered and the ability of local governments to carry out social policies would therefore be severely restricted and democratic accountability disabled. 4. Local authorities would be further undermined by the most contested aspect of TTIP: investor-state dispute settlement (ISDS). Under ISDS, corporations would have the power to sue national governments through ad hoc secret panels of corporate lawyers if they felt their investments or anticipated profits might suffer from any imposition, such as local authority contract compliance (see ‘performance requirements’ as in 3 above). The sums awarded in such disputes have been astronomical and have a chill factor on policy-making that would also be felt at the local level. If agreed, TTIP will be potentially catastrophic for public services as the EU/US representatives are negotiating to hand over the right to regulate in the public interest without transparency or accountability to their electorates. and the treaty would cause damage to local material and social well-being. 1. To write to the Prime Minister, Deputy Prime Minister, the Leader of the Opposition, the Secretary of State for Communities and Local Government and the Secretary of State for Business Innovation and Skills to call upon them to reject TTIP. 2. To publicise their stance on TTIP and the dangers it poses. 3. To write [to the County Councils Network and] the Local Government Association to urge them to lobby on behalf of all Local Authorities on the potential impact of the TTIP.